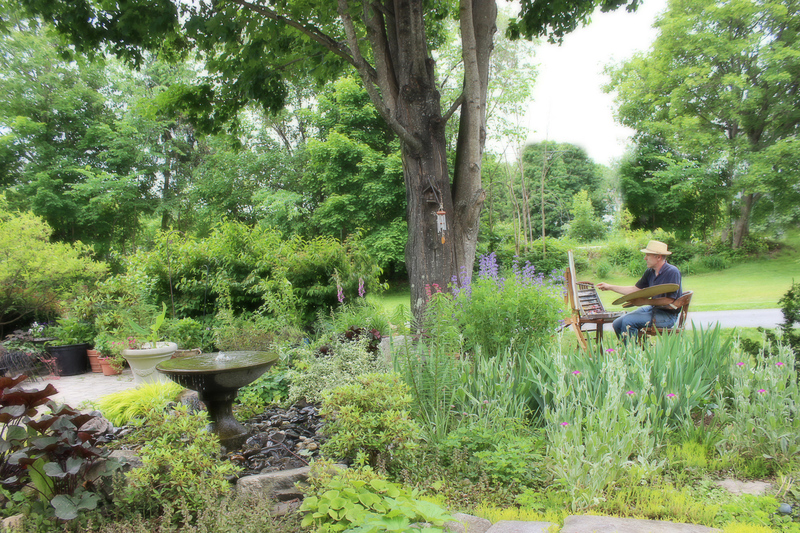 Spend the month of June 2014 painting with John C. Traynor in his scenic New England hometown. Start planning your trip now to learn from John C. Traynor. 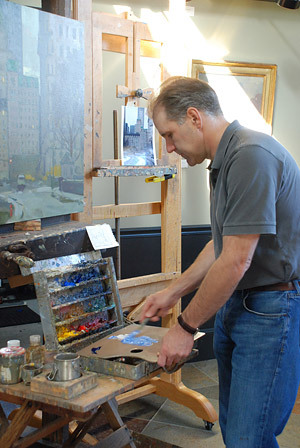 Take this opportunity to see his favorite painting locations that surround his studio in southwestern, New Hampshire. Including beautiful painting locations such as Mt. Monadnock. CLASSES – Classes will meet on Mondays, Wednesday and Fridays. Classes will meet at different times throughout the weeks (early morning or mid to late afternoon), and will last about 4 hours. Students of all levels of ability are welcome. The first class will be Monday June 2nd, 2014 and the last class will be held Friday June 27th, 2014. The Salmagundi, as I said, is a venerated institution, the elegant old brownstone that houses it (the last standing on New York’s Fifth Avenue), a building that exudes culture and history, each of its rooms tastefully retaining its past glory — not the least the main gallery, which is a wonderful place to exhibit artwork. On the evening of my visit (May 21), the gallery held the John C. Traynor exhibition, nearly 100 paintings that had a fairly uniform distribution of city- and landscapes, florals, and genre scenes depicting figures in various situations and activities — most of which highlighted Traynor’s considerable skill in depicting the play of light on form. A formidable talent, Traynor displays a constant expertise, an unerring eye for perceptual illusions and a keen sense of the vagaries of form, space and color. Using a mosaic-like “patching” of brush-strokes, he manages to meld what up close appears disjointed to be, in fact, a unified whole — in other words, creating images in much the same fashion as our eyes make “sense” of the world around us. He is especially adept at making “real” the properties and influence of light as it affects the visual process — a particularly difficult problem for painters since, unlike form, it has no actual “substance”. Though varied in subject and motif, Traynor manages to impose a coherent aesthetic vision on his viewers, offering a body of work that is “of a piece” — confident, believable, compellingly “true”. This is work that deserves wide recognition and the pity is that the show only had a six-day venue, coming down on May 23rd — so I was indeed fortunate to get a chance to view it. The “icing on the cake” for the evening of my visit was to sit in this gallery — surrounded by these light-filled canvases — to listen to the talents of soprano Gretchen Farrar, accompanied by guitarist Francisco Roldán and pianist Alexander Wu, the group offering up a potpourri of songs and music that ranged from Spain, Puerto Rico, The Dominican Republic, Venezuela, Argentina, Brazil and Mexico to our own U.S.A. Far from clashing with Traynor’s paintings (my usual fear of lumping disciplines together notwithstanding) the experience of Gretchen Farrar, the soprano, singing “Madrugada” (“Dawn”) with Traynor’s Sunrise Through the Tuscan Hills as a backdrop — a 48″ x 72″ oil that featured a blazing sun on the horizon — was almost overwhelming in its impact and certainly an image that will linger in my mind for some time. The rest of the performance was equally harmonious with its elaborate “stage set” — I could not have asked for a more pleasing evening and came away with absolutely no regrets. My evening of Art, Music and Dinner at the Salmagundi Club was wonderful! Neoteric Art: Give us a little history on yourself. John C. Traynor: I was born and raised in western New Jersey. I had an interest in painting at an early age. I graduated early from Delbarton High School and entered Paier College of Art at the age of 16. 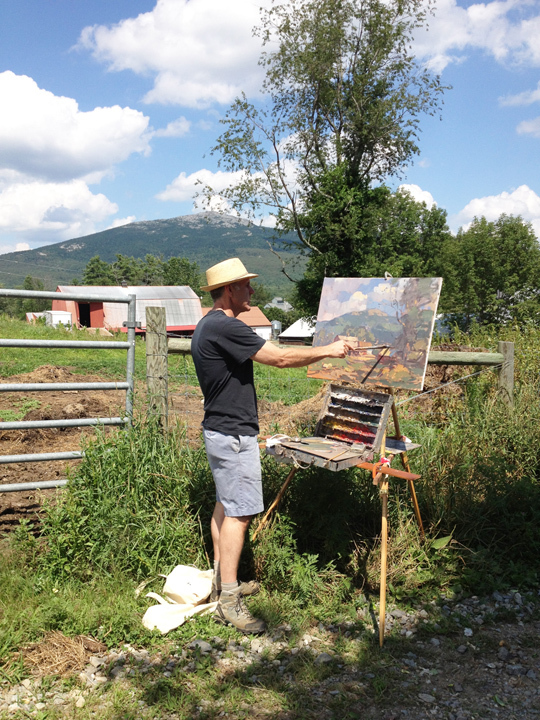 While at Paier I studied landscape painting during the summer in Vermont with Frank Mason. I also studied with Carroll N Jones during my time in Vermont. After attending Paier College of Art for three years I left to study sculpture in Florence Italy. After returning from Italy I studied at the Art Students League in New York for two years. While at the League I began pursuing my career as a professional artist. NA: You paint landscape, portraiture and still life. Do you approach these different types of paintings the same way? JCT: I approach all my paintings subjects in the same way. With each I am trying to create a sense of light, space and atmosphere. I may on occasion do a black and white under painting for a formal portrait. NA: Describe your overall work/thought process when starting a new work. JCT: I usually start with a compositional sketch on paper. Working on a lightly warm toned canvas I cover the surface with half toned coat of paint and medium. I quickly draw the basic shapes with a shadow tone of paint on my brush. I then build the lights and darks and go to the lightest light as the paint dries. 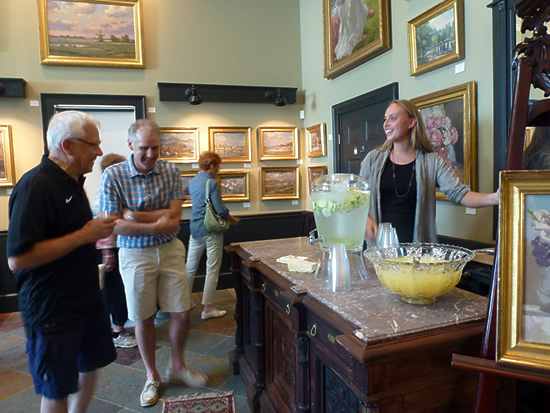 NA: The Salmagundi Club of New York City recently purchased one of your paintings for their permanent collection. How was that experience? JCT: The Salmagundi Club has a wonderful collection of paintings purchased from artist members from the 19th and early 20th century. They have recently brought back the tradition of purchasing members paintings. I have always admired their extensive collection and to be included in that collection is a great honor for me. NA: Have you been to any recent art exhibitions and/or gallery shows that you really enjoyed? JCT: Two years ago I was the Sorolla/Sargent exhibit in the Petit Palais, Paris. It was an amazing exhibition with great paintings from both artists. Last year I was fortunate to see the Cecilia Beaux exhibition at the Pennsylvania Academy of Fine Arts in Philadelphia. The Beaux exhibit was quite extensive and covered many years of her work. NA: You’ve placed a few advertisements in American Art Review Magazine. How is that working out? JCT: I’ve been advertising in American Art Review for about ten years. It gives my paintings national exposure that would be difficult to have otherwise. It has brought my work to the attention of both galleries and collectors. The Samagundi Club of New York City has purchased John C Traynor’s painting “Honeymoon in Venice” for their permanent collection. The Club, originating in 1871 and following a tradition of 138 years has served as a center for fine artists from New York and around the country. 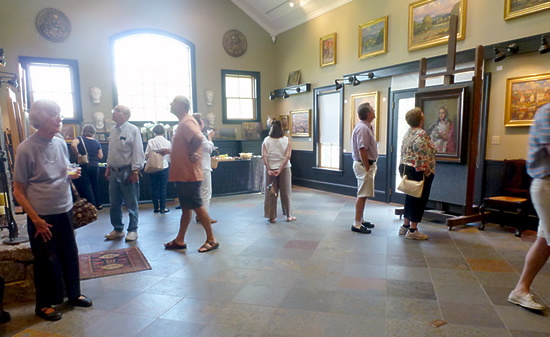 The permanent collection includes paintings by Ralph Blakelock, William Merritt Chase, Childe Hassam, John LaFarge, Frederic Church, Emil Carlsen and other notable artists. Fall is here! And what a warm fall it has been here in New Hampshire. The colors are just beginning to turn and I am looking forward to getting out and painting the beautiful fall colors. For the last few weeks I have been cutting my sunflowers from my gardens and enjoying painting them in all shapes and sizes. 2013 has been a year full of accomplishments, to say the least. One of my biggest was training for and finishing my first marathon. It was an amazing accomplishment for me and happy to say that all the training truly paid off. I had my open studio show in August, which was a huge success. The weather could not have been better. People came from near and far to meet me and see my newest paintings. I always enjoy this opportunity to meet with buyers, collectors, artists and of course my neighbors. Since my studio show in August, I have been working on some new paintings for my show at Haley & Steele on Newbury Street in Boston, MA and my show at The Harrison Gallery on Spring Street in Williamstown, MA. I have also been finalizing the details for my painting class for June 2014. Please email me if you are interested in hearing more at mail@johnctraynor.com. This class is for all levels. Wow, what a summer it has been so far! I had a great time revisiting Martha’s Vineyard for my show opening at The Christina Gallery in Edgartown, MA. It was great to see friends and familiar faces around the island. If you are on the island stop in to see my latest paintings. The weather has been very hot these last couple of weeks. I have escaped to Watch Hill, Rhode Island a few times so far this summer to get away from the heat. I have been enjoying the scenery and getting as many paintings in during my time there. It is a fabulous time of year to travel towards the ocean. I have recently brought new painting to Lily Pad Gallery in Watch Hill. Stop in and let me know what you think. I am working with an intern this summer and helping her learn oil painting and the basic principles of painting. It has been good for me to review and revisit these painting principles. We have been taking lots of day trips and exploring new scenery in and around West Swanzey, NH. If you have any suggestions of a location for us to visit let me know. I am always looking for suggestions. My gardens are in full bloom. Sunflowers, Zinnias, Dahlias and many more annuals have been planted and I am looking forward to painting them later this summer. I really enjoy walking around my gardens daily and discovering the new flowers that are in bloom. I have a new black lab puppy, that has been keeping me very busy these days. She has been a great addition to my life and is keeping me on my toes. She has been taking lots of road trips with me and I can always count on her to keep me company. Needless to say I have been painting, painting, painting. I have my studio show coming up on August 17th, 2013, here in West Swanzey, New Hampshire. I am very excited to show you all my surrounds, my newest paintings and aspire others the best I can. I have been painting local scenery and finishing up paintings from my past travels. Please email if you need any more details about this day. Keep cool and enjoy the rest of your summer!